The activity is held through ‘community’, this means the students will share the class with community members. Mr. Helmut Guesten is the instructor and the class starts 6.00am promptly in the center gym Wednesdays. The list of attendances will be forwarded to the instructor. Students need to have signed up 1 week prior to start of the activity. The activity will start after the mid-semester holidays. The gym is located in the center building, 3rd floor. Students will OPEN the door and WALK into the gym, ready to exercise at 6.00. The finishing time is approximately 7.15am and students will need to shower / eat afterwards (bringing their own small snack). 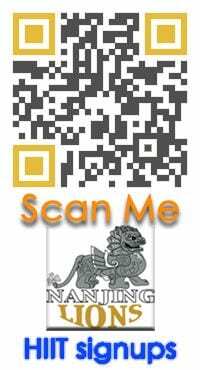 If you are interested, please sign up through the attached QR code. Anastasiya Shkurdai rocked two new Belarusian National Records over the weekend, entering the world’s top 10 in the 100m fly and 50m fly in the process. At only 15 years of age, Beril Böcekler set her third Turkish national record in the 400 free with her time of 4:15.75 on the final night of the 2019 Turkish National Team Selection Meet. After 3 days of the Spanish Open, Mireia Belmonte sealed her 4th victory of the meet and 2nd worlds qualifying event in the 1500 free. After day 3 of the Spanish Open, Spain has qualified 3 swimmers to the FINA Worlds roster. Chad Le Clos and Erin Gallagher are headed to Gwangju. Olympian Chad Le Clos completed the dirty double of the 200m fly and 100m free on night 1 of the 2019 South African National Swimming Championships. Check out who of the Danish elite have qualified thus far for this summer’s World Championships.